Queenstown is famous for its fast-paced snow, land and water activities and for Bucks parties seeking to experience the most incredible adventures you can possibly have in one destination. When your heart rate calms down, you can regroup and refuel again amongst Queenstown’s incredible bars, great Kiwi cuisine, wines, beers, and the enjoy the stunning local ladies. 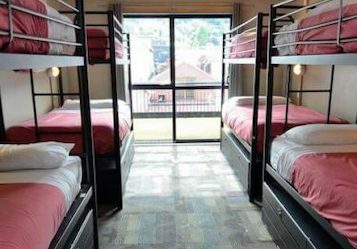 To make sure you have the Bucks trip of a lifetime we have hand-picked the ‘best of the best’ accommodations that Queenstown has available. We are that confident you’ll love them – you may never want to leave. At Wicked Bucks, we offer a range of activities and accommodation options to suit everyone’s tastes and budgets. Get in touch with the party planning girls today for a custom package. With everything under one roof this popular budget accommodation is your one-stop accommodation for both you and your Buck. If it’s comfort, fun and adventure that you’re after then you have found the right place. Centrally located, your group is right in the midst of the action here. This is going to be a crazy weekend, so we need to make it as easy as possible for you to get home! Experience a Queenstown alpine stay at a fraction of the cost. This property has amazing accommodation options to choose from: the lads may to bunk down in the tree house, mini mill, mill house, the homestead or an exclusive separate house that sleeps up to 24 of your best mates. All of them have different facilities including kitchens, en-suite bathrooms entertainment areas, and some have private gardens with BBQ’s, perfect for beers with your mates. This gorgeous contemporary chalet style 3-bedroom apartment sits on top of one of Queenstown’s best-rated bars. Boasting three bedrooms, it sleeps up to a whopping ten guests! 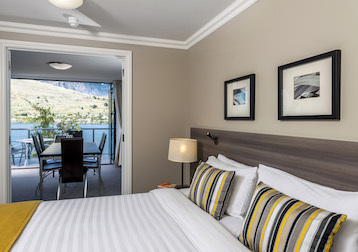 Situated in the heart of Queenstown’s CBD, you’d be hard pressed to find accommodation any closer to the action! Guests choose from a funky bunk option or a queen bedroom. We think it’s first come, first serve! Fitted out with a large open living plan, comfy sofa, 50-inch TV, a massive front patio, and overlooking the venues beer garden â€“ this is the ultimate place to call home while on your Bucks Party getaway! This four-star property is an ideal choice for Bucks groups that want to live it up in style! These luxuriously appointed apartments offer first-class facilities for you and the boys. 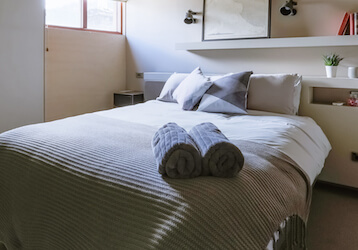 Choose from 2, 3, and 4 bedroom apartments – this is a favourite amongst Wicked Bucks groups to take in everything Queenstown has to offer, in luxury and style. Not only are these apartments large enough to accommodate all your Bucks party entertainment needs – but the facilities are lush! Including BBQ’s, a sauna, and free shuttle service into town. Set against the Southern Island’s Remarkable mountain range and boasting stunning views of Lake Wakatipu, this 4-star property offers spacious apartment-style accommodation in Central Queenstown. Choose from stylish apartments or pimped out penthouses. These apartments are large enough to accommodate all Bucks party entertainment needs. You’ll be setting the scene for an impressive night! This hotel is perfectly positioned to make the most of what New Zealand’s most sought-after holiday destination has to offer!